The makers of Path — the social network that was somewhat anti-social in that it limited your network to 50 of your closest friends — have released a new app that goes to the opposite end of the spectrum by allowing anyone with a Twitter handle to play. WITH (or w/ for short), now available for iPhone (s aapl) and iPod touch, is designed around the idea of sharing whom you’re with, whether they’re part of your personal network or not. Basically, WITH lets you tag another Twitter user (or users), and optionally take a photo of or with said user, then post it to both the WITH network and Twitter itself. You can also like the posts of other users, and use free and premium (available through in-app purchase) filters to add Instagram-style effects to the photos you include. The more you check in with specific people, the higher they rise in your profile. If you get close enough with friends through multiple check-ins, you can receive “special benefits,” according to Path. You can also follow and unfollow people on WITH, independent of whether or not you follow them on Twitter. 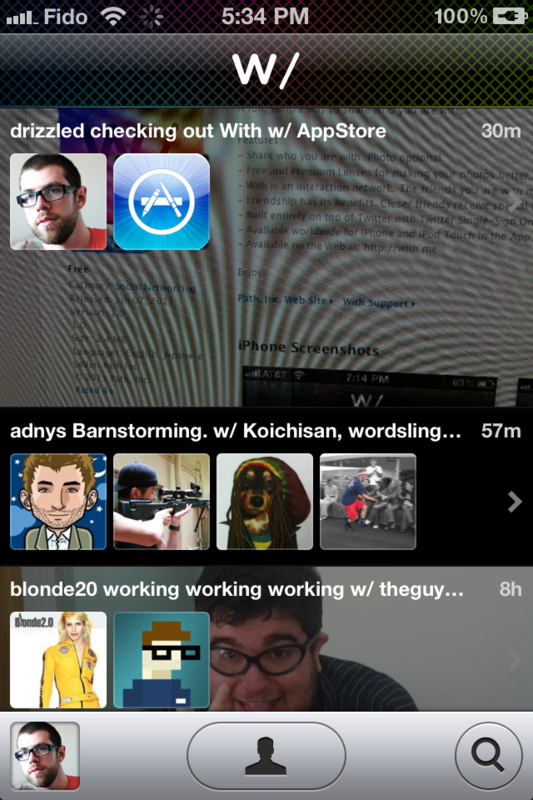 There’s also a with.me web-based presence for the app, although at the moment it just points you to the App Store. WITH is more useful than Path, because it doesn’t have any arbitrary limit to the size of your network. But WITH is also far more dependent on Twitter than Path, or Instagram, which is probably closer in concept. That’s a strength because it lets you sign on quickly and easily (you do have to provide your email in addition to your Twitter credentials, so it isn’t quite one step), but it also means that in many ways, WITH feels like a cool user-created feature for Twitter, rather than an independent, standalone product. Twitter’s @ replies and hashtags started out from similar, albeit more organic, roots. WITH seems a little rough around the edges (figuring out how to post took a little while to figure out; it’s the person icon at the bottom in case you were wondering), but it seems like a more generally appealing product than Path. Plus, now that Apple has announced system-wide integration for Twitter in iOS 5, the fact that it relies on Twitter for its existence might not be such a bad thing, though Twitter itself is racking up a nasty reputation when it comes to playing nice with outside devs. We could see more apps like WITH betting heavy on Twitter now that it has the Cupertino seal of approval, however, so we’ll have to wait and see how the social network handles more attempts to exploit its services. Lame! What problem is with.me solving? Not sure why big name blogs are reporting these lame apps and not focusing on finding undiscovered useful product. Maybe just because With.me is done by Path guys. “figuring out how to post took a little while to figure out; itâ€™s the person icon at the bottom in case you were wondering”. Are you kidding? It’s the button in the middle just like the camera! And it’s bigger than the other two on the side. How was that party last night? The Path UI is even harder to work out than color. What is with photo sharing apps being impossible to use?